When around 15 police trucks came to Kibera a few weeks ago to witness and protect the demolition of schools along the railway line, there was shock and tension as Spurgeons school was targeted. But before the bulldozer could reach the permanent building, the community members turned up in large numbers to stop the demolition, saying that the school belonged to them. They claimed that the school has been helping their needy children and they could not sit back and watch it go down. By this time, St. Juliet Educational Center, Kibera Academy Primary (also known as Huruma) and Kibera Academy Secondary were already down. The Head Teacher of St. Juliet, Mr. Jared Musula, was so furious with the act and wondered why some schools were left along the way before reaching his school. 47 schools, along with other structures including churches are expected to be demolished during the project, but attention to St. Juliet and Spurgeon forced a halt on the process for a while. Kenya Railways decided several years ago to expand the railway buffer and reclaim the land, citing safety and interference with train passage. In 2010 they made their most recent enumeration of the residents and businesses along the track targeted for demolition, but residents say that these are already outdated. While residents have been promised new housing, they do not appear to have made concessions for the schools operating in the buffer area, other than saying that the schools be shut down and students enrolled at nearby government schools. 2. 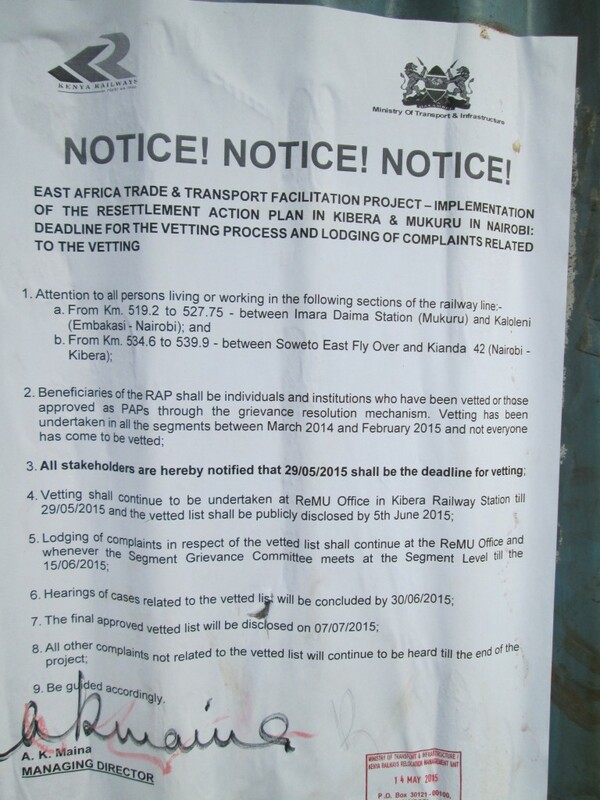 The Respondent’s cross-petition succeeds and it is hereby ordered that the recent illegal occupiers of the Railway Reserve whose names do not appear in the list of the Project Affected Persons do move out of the Railway Reserve and allow the Corporation to proceed with the Resettlement plan. That at the time of eviction, neutral observers should be allowed to access to the suit properties to ensure compliance with international human rights principles. That there must be a mandatory presence of Government officials and security officers. That there must be compliance with the right to human dignity, life and security of the evictees. That the evictions must not take place at night, in bad weather, during festivals or holidays, prior to any elections, during or just prior to school exams and in fact preferably at the end of the school term or holidays. 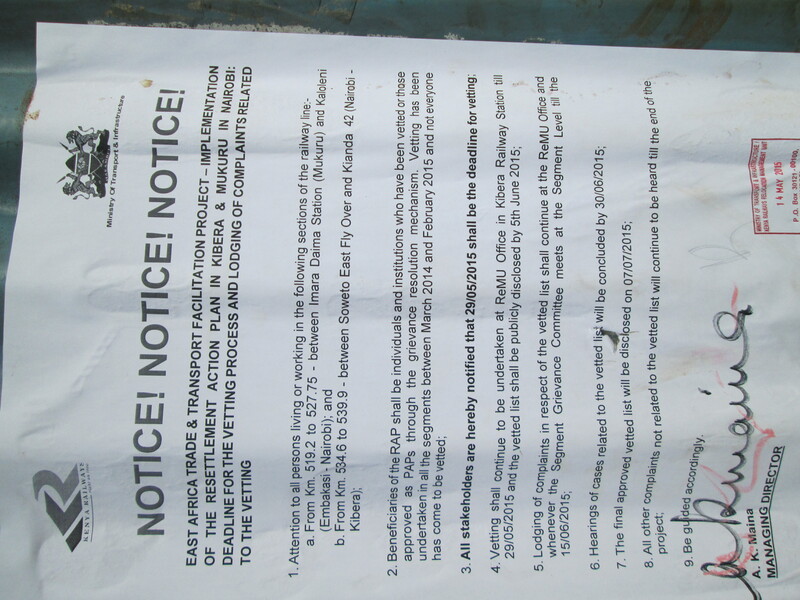 The PAPs had demanded in their petition that a review of the enumeration be done since a lot of things had changed since 2010 when the last enumeration was done, but the Kenya Railways refused saying that it was going to be a waste of money and time and would only add more complications to the plan. 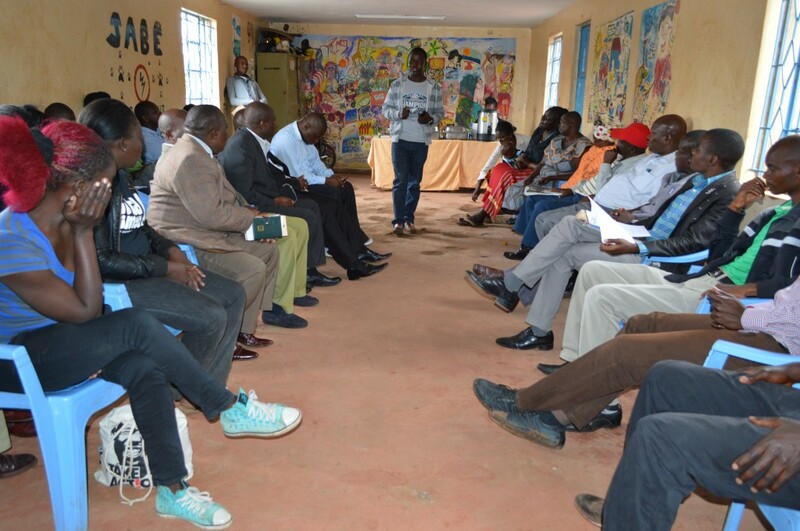 Recently, Langata Youths Network organized a forum to bring together all the affected schools and churches along the Railway to look at the way forward. They resolved that the people concerned with the demolitions be engaged further to make them understand why dialogue was still important in every stage and step they make. They also said that they will try to respect the court ruling by all means, but they wanted to understand who made the decision that some schools to remain while others to be demolished. The group then formed a committee to help follow up with all the relevant offices. There has been a lot of silence since the demolition of the few schools happened, until recently when we saw a notice posted asking the PAPs to go for a vetting process. This sounded to me like a review that they had all along been crying for only called by a different name or word. It says that the vetting and complaint lodges will continue and a final list of the PAPs would be published publicly. Meanwhile the schools already demolished are proceeding with learning as best they can. St Juliet returned some of its class roofs, while Spurgeon is squeezing inside their permanent building that the community members had narrowly rescued in the presence of heavily armed police. 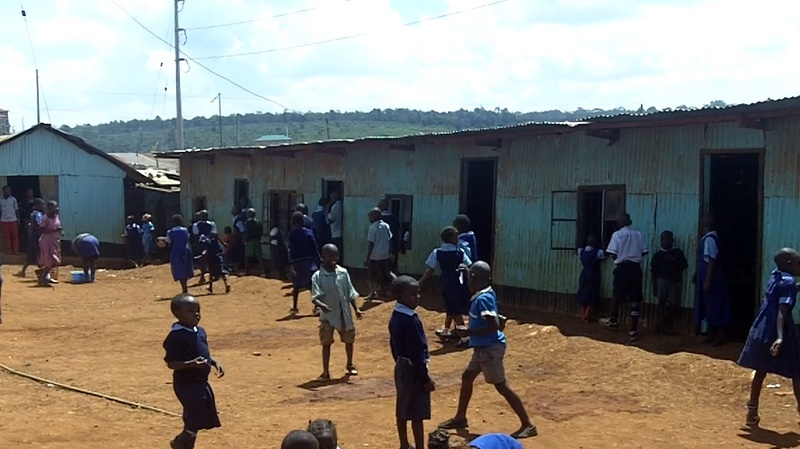 According to the Relocation Action Plan (RAP) Document the Schools along the railway should close down and send their students to the few public schools in Kibra, but the Schools wondered how they would do it since the RAP did not give a proper guideline on who is responsible for taking the students to those particular public schools, and were not sure whether they would be admitted. This piece was a collaborative report by Map Kibera’s team as part of the Open Schools Kenya project. 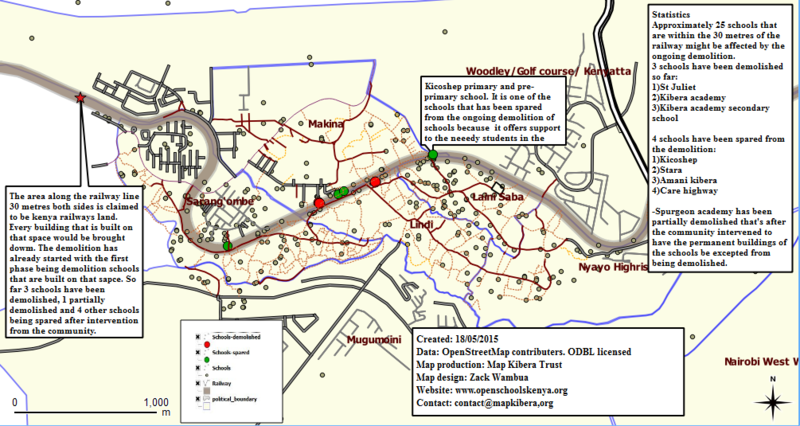 Reported by Joshua Ogure, with map by Zacharia Wambua, school locations by Lucy Fondo and Douglas Namale, and reporting from Steve Banner and Jacob Ouma. Map Kibera is now partnering with GroundTruth Initiative, Development Gateway, Feedback Labs, and the Gates Foundation to gather and share information about schools in Kibera. We will include citizen data and maps, authoritative data, and citizen feedback on education and schools, including the informal sector, making school data transparent and useful to everyone from citizens to NGOs to government. This is the first of a series of blog posts by our Map Kibera resident team that will detail our progress. Map Kibera members have recently been talking to many people – from parents of school children, to school directors – to gather their thoughts about education in Kibera. Education is the key to success in life, so they say. But the information on where the genuine key is offered has proved to be challenge to many parents in Kibera, and some just prefer getting the counterfeit keys than no keys at all, call it informal education. “We give formal education in an informal setting. If you are going to give informal education to these children, and you expect them to compete with others, I think it’s going to be a very big challenge,” observes Fred Ogutu, School Director at Hope Academy. 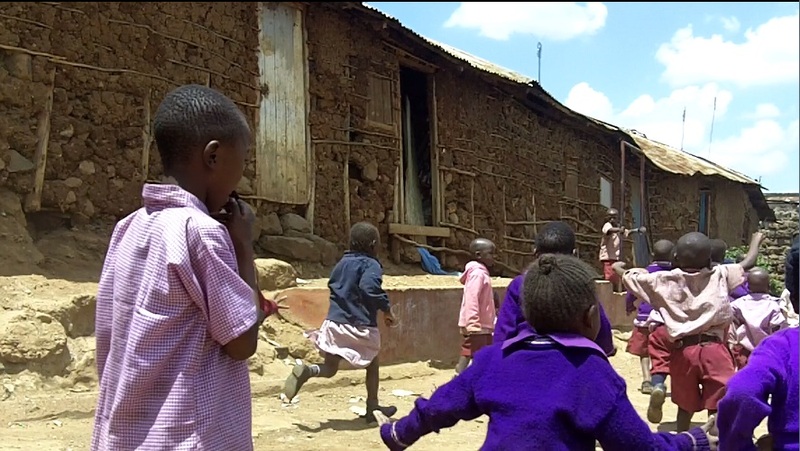 The problems that hinder children from Kibera slums from acquiring quality education vary from village to village and school to school, though most of these problems are common in almost all the villages and schools that make up the Kibera slums. Access to information, or lack of it, is far most the number one challenge that affect both the parents and schools. Most parents, due to various reasons that include poverty, are unable to know which school offers the right key to success and they mostly go for the cheapest school available or as advised by another parent who probably has a child in the same school, or both. 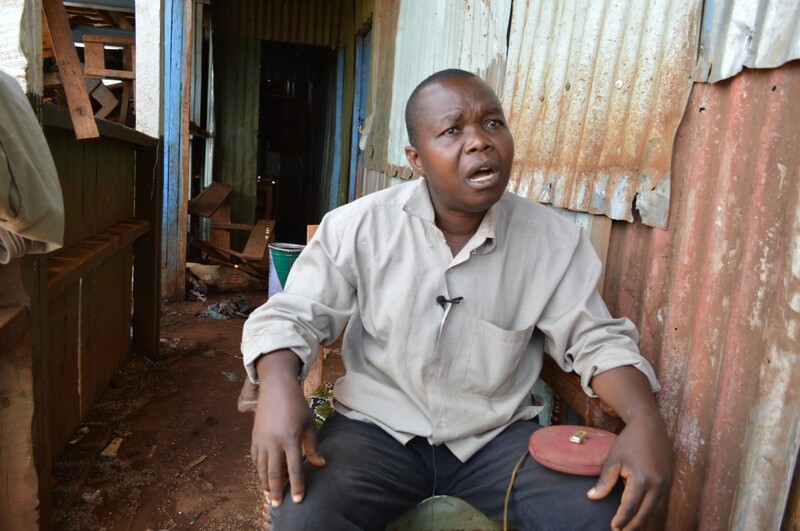 “We live here, we know the challenges that they have, one of them is paying school fees,” says one George Oketch, a teacher at Strays School in Kibera. Another problem that affects the children, especially those in upper primary and high schools, is engaging in drugs and criminal activities that make them not be able to be in class when required. A high percentage of private schools, lack enough books and classrooms to accommodate the large number of children who join the schools from the public schools. Whereas in public schools, the missing tool is quality education. Many parents interviewed believe that the teachers in public schools are no longer committed to their work since the introduction of free primary education. This has led to quality of education moving down the scale, hence success becoming more of a dream than a reality in these public schools. But another challenge is that, most of the private schools have not advanced beyond classes four and five, which forces parents to turn to public schools for upper primary education. Which reminds me, school directors at both Wisdom Ashrays academy and Great Achievers school calls their schools complimentary schools. As a matter of fact, Wisdom Ashrays Director went further to say that there is no private school in Kibera and all schools that are not Public are complimentary schools, which left us a little bit confused. The clarification given to us concerning this was that, complimentary schools are not recognized by the government and the schools are still pushing for them to be recognized. “But I thought all schools that are not public are private schools, because they are owned privately,” I asked myself that. Well, I learnt about complimentary schools for the first time. Fred Ogutu, school director at Hope Academy believes that education is part of upgrading the children’s minds to bring positive change in the community. He also observed that the land in which most of these schools sit is government land, which makes it difficult for donors to help build permanent classrooms because most of the school owners are not sure how long they will be on the land before evictions take place. “If you have a very temporary thinking about your land tenure system, you cannot invest,” says Fred Ogutu. Poverty and joblessness has been identified as the biggest problem facing parents in having their children get quality education, as identified by both the parents themselves and teachers. This leads to the children being absent from class most of the time because they either lack school fees or are involved in other income generating activities that prevent them from attending school. This sometimes doubles up with other domestic issues where the parents quarrel hence creating a No-learning atmosphere. Teachers also pointed out that the Kibera environment does not favour the schools, especially those deep in the slum, because when it rains, it gets so muddy and most children cannot make it to school. Many schools also overflow with a very large number of children in class, this applied to both the private and public schools. Almost all schools that the survey was carried through offer lunch for the children, at a fee of course, except for the few that have feeding program support such as Mashimoni Squatters School whose feeding program is sponsored by the World Food Program. Most parents, before taking their children to school, consider Distance, that is how close the schools is from where they live; cost in terms of schools fees; and if the schools offer some food because most of these parents go for work during the day, so they prefer that their children feed at school. Children are the only raw materials from which you can manufacture responsible human beings, and the concerned parties need to do their best to ensure all children in the slums get good quality education that can help them in the future and shape them to be responsible successful adults. But until the right and genuine key is given, that is education, success will continue to be a door that is only talked about but never opened. You are currently browsing entries tagged with Schools at Map Kibera.